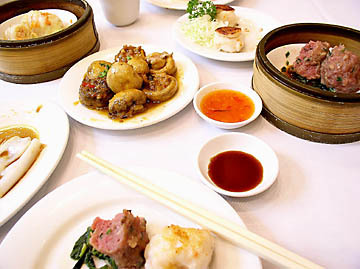 In Hong Kong and throughout Cantonese China, dim sum plays a fundamental role in the fabric of social and culinary life. Dim sum grew out of teahouse culture, offering a late morning snack to nibble with friends over a pot of fine tea and spirited conversation. "Dim sum" translates roughly as "heart's delight." These little morsels may take form as dumplings filled with meat, light fresh greens, aromatic fish cakes, miniature pastries, a wide variety of savory or sweet, steamed or fried, hot or cold bite-sized wonders. I have joined my extended family at crowded Cantonese restaurants in Los Angeles and San Francisco, where the Sunday morning tradition of dim sum lunch attracts long lines at the door. I came to appreciate the mildly frenzied chaos of the most popular dim sum spots. The busiest serve the freshest food. I set out to find such restaurants in our area, and I'm happy to say we have some excellent choices. 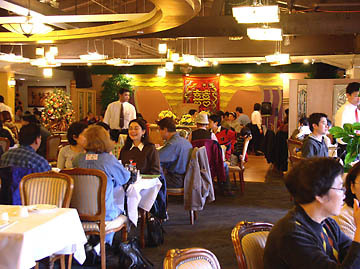 In a typically large room packed with tables, servers push steam carts or carry trays of delicacies from the kitchen, weaving down the isles like merchants selling their wares. Patrons select what they fancy, and receive a stamp on their ticket reflecting the price of each plate. Author Rhoda Yee tells of a Hong Kong teahouse in her father's day, where servers charged each table by counting the plates stacked up after a meal. Students would sneak discounts by surreptitiously tossing plates out the window. Luckily for us, a dim sum lunch rarely costs very much, so such drastic discounts shouldn't prove necessary. Closest to home for Mountain View residents, the Golden Wok serves dim sum daily from 11 AM to 3 PM. Several of my friends expressed fondness for Golden Wok's dim sum, saying it was the hidden strong point of this stalwart downtown restaurant. We visited Golden Wok a bit late on a Saturday, around 1 PM, expecting a weekend crowd. We were a bit surprised to find the room half full. Service came quickly with jasmine tea and a hand-carried tray with steamed rice noodle rolls (gee cheung fun) stuffed with pork or shrimp. The shrimp fun were cold but fresh tasting, with a light sweetened soy dressing. Next we tried the fried crab claw, a savory breaded lollipop of crabmeat with claw protruding. Likewise, the crab was no longer very hot, and it had become a bit greasy as it cooled. Few of the dishes we tried during that visit had come fresh out of the kitchen, a problem any dim sum restaurant faces when not busy. A welcome exception, the tasty siu mai (steamed pork dumpling) came steaming to our table, and had a fresh balance of green onion blended with the chewy pork filling. I often save steamed barbequed pork buns (cha siu bow) for dessert, relishing the faintly sweet puffy dough filled with sweet-sour bits of smoked pork. These satisfied my craving, but I felt the filling used too much corn starch, leaving a slightly cloying texture in the mouth. Our lunch was swift and pleasant, without the usual chaotic teahouse bustle. It cost a very reasonable $21 for two including tip. I look forward to returning to Golden Wok on a busier day, when the plates spend less time circulating outside of the kitchen. A short drive to the Town & Country center in Sunnyvale found us at Bamboo Garden, a tastefully appointed sizable restaurant serving dim sum daily. On a late Sunday morning, the room filled almost to capacity, servers bustled through with stainless steel carts brimming with bamboo steamers, plates of pastries, tofu pots and more. Moments after we sat down, a cart rolled up to our table with morsels on display. A wide variety of dishes roamed the floor, including some old-world delicacies that might not appeal to squeemish westerners (tripe, chicken feet, baby octopus, jellyfish etc.) Plenty more familiar choices passed our table as well, but I was glad to see such an uncompromising selection. A picture menu with almost 50 selections offered a means to order items that weren't working their way past our table. For me, though, half the fun comes from fishing among the roaming selection. All our plates arrived steaming hot and fresh. They exhibited light flavors and contrasting textures. Fried items crunched crisply with minimal greasiness. I especially enjoyed the almond squid rolls, three firm chewey fish cakes fried in a coat of slivered almonds. Strips of scallions added aromatic freshness to the fish while the almonds contrasted with a brittle rich crunch. The spinach dumplings also showed well-conceived contrast in textures, with thin rice flour wrapper surrounding earthy spinach intermingled with tiny crumbs of crunch, possibly bamboo shoots judging from the delicate nutty flavor. Siu mai tasted fresh and lean, plump and firm in the mouth. Pork bow were steaming hot, puffy and light, good quality lean meat filling the center in a balanced sweet-savory sauce. Dishes ranged in price from $2.20 to $3.50, with specialty items $4.95, tea $1.60. Our lunch added up to a mere $23 with tip for two. I asked some friends for other dim sum recommendations, hoping to find large bustling Chinatown-style tea rooms nearby. I found one at Joy Luck Place next to Ranch 99 market in Cupertino. By far the largest and loudest of the three restaurants we compared, Joy Luck had a line out the door that never seemed to dwindle. The line moved fast and we had a table in 20 minutes. Service showed cheerful attentiveness, bustling and graceful. Items on display ranged from standard faire to exotic, including some fancier, slightly more pricey items. Everything arrived steaming hot and fresh. I happily noted that our first server asked us what kind of tea we wanted. Their selection included jasmine, chrysanthemum, oolong, shou mei, and pu-erh ($1/person). I selected my favorite, pu-erh, aged fermented tea with an earthy grassy flavor as complex as fine wine. Joy Luck's dim sum tasted a bit heavier than Bamboo Garden's, with slightly simpler meaty flavors. I prefered Bamboo Garden's lighter touch, more aromatic and less oily; but I loved Joy Luck's refined presentation. Servers would spoon sauces onto our selections as we watched. Tiny dishes of spicy dips soon decorated our table with varied colors. The shrimp noodle rolls had a surprising dollop of peanut butter inside, adding richness to an often very light dish. The beef dumplings were huge and filling, steamed rare and moist inside, on a bed of spinach. Mushroom caps stuffed with pork and shrimp tasted earthy and rich, though milder than expected. Fried crab claw lollipops were searing hot from the kitchen, meaty with a minimum of binder. Shrimp and cabbage dumplings tasted light and fresh. Our highlight came in the form of three scallops, layered with fish cake on the bottom, seared crusty brown on top, served with sweet hot pepper sauce. This deeply flavorful artwork certainly deserves the name "heart's delight." Prices ranged from $2.20 to $3.80, with barbeque items and specialties $5.50. We ate regally for $35 including tip. For a more posh dim sum experience, I can recommend Hong Kong Flower Lounge (560 Waverly St., Palo Alto). In a calmer upscale setting, its meticulously prepared dim sum delivers some of the most refined flavors in the area, at premium prices. Several other regional restaurants serve excellent dim sum. Most seem concentrated in Cupertino and Milpitas. I can recommend Canton Delights (10125 Bandley Dr., Cupertino, near Homestead), which has a mellower atmosphere than nearby Joy Luck Place. Wherever you find it, dim sum offers a treat for the eye and the palate, casual and sociable, affordable and habit-forming.